Reddit recently witnessed a major breach of accounts involving members of the Bitcoin cash subreddit. The passwords were many members of the community including the administrator of r/btc were modified by hackers and the cryptocurrency was stolen from their HotWallet. After addressing the attack as a minor one, Reddit is now making sure that the accounts of users are securer and that an additional layer of security thwarts attempts of sabotage. As a result, Reddit is now adding two-factor authentication for all users – a feature which was earlier limited to select moderators and test volunteers. 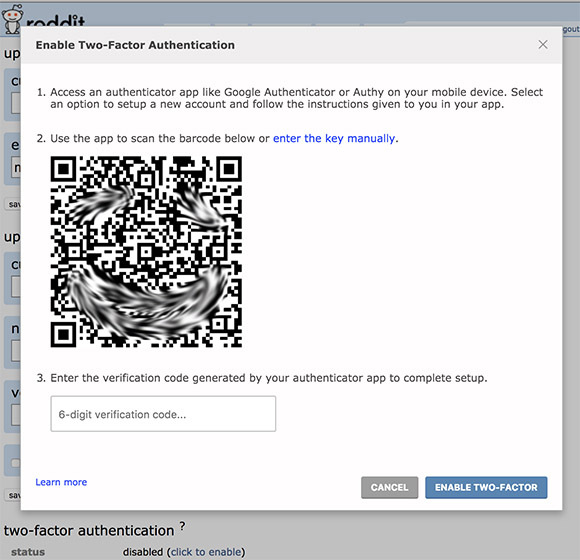 The process to turn on two-factor authentication is fairly easy. Open Reddit in a desktop browser, click on “Preferences” and head over to “password/email” tab or just follow this link. Nearly at the bottom, you’ll be able to spot the option to “click to enable” two-factor authentication. Make sure, the e-mail ID attached to your Reddit account is verified. Because Reddit doesn’t favor sending verification codes via SMS, you’ll be required to install a TOTP-based authorizing app like Google Authenticator or Authy. Scan the QR code and enter the code in the box and two-factor authentication will be activated on your account. Since Reddit’s official mobile app doesn’t support updating the password, using a desktop browser (or web-browser with desktop mode) is necessary. To make sure that your Reddit account has a dual layer of protection, make sure that you update the mobile app to the latest version, log out and log in once again. It is also useful to generate backup codes so that you can access your account, even if you lose your smartphone which has the authenticator app installed. Reddit also allows users to switch off two-factor authentication in case they don’t have any private content. Lastly, it is important to make sure that you don’t use the same passwords for your email ID and Reddit accounts. This development appears to be in line with Reddit’s attempts to garner more advertising bucks and a major UI overhaul to offer a clutter-free and minimal “front page of the internet”.